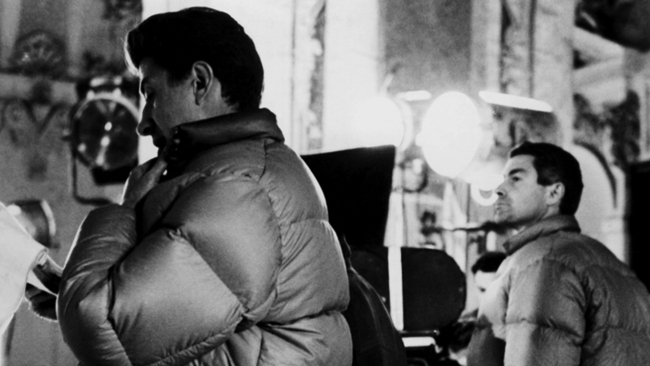 The following tribute to Sacha Vierny by Alain Resnais (pictured together above, Resnais left) was published in the October 2001 issue of Positif. It is based on an interview conducted by François Thomas and was translated for Criterion by Nicholas Elliott. Vierny, one of the most influential European cinematographers of the past fifty years, shot seven of Resnais’ features, including Last Year at Marienbad, Stavisky . . . , and L’amour à mort, and was also a faithful collaborator of Raoul Ruiz’s and Peter Greenaway’s. He died in May 2001. My earliest memories of Sacha Vierny go back more than half a century, to our first meeting in 1948 or 1949. I can’t remember if we met through a phone call, a chance encounter in a stairwell, or at the counter of a brasserie. I had shot a few 16 mm films in Kodachrome, one of the first monopack color processes, which combined three ultrathin emulsion layers on a single strip of film (this was before Eastmancolor). So Vierny introduced himself with: “We won’t have Kodachrome in professional 35 mm for several months. I’d like to talk with you about the ups and downs of your experience with color film.” He was exaggerating—my knowledge was empirical but limited—and I was truly flattered that someone in the business wanted to talk shop with me. Probably I was a little sorry that I wasn’t a cameraman. Had I been in better health, I would have applied to the cinematography department at the IDHEC [Institut des hautes études cinématographiques, the French state film school] rather than the editing department. But to be a cameraman you had to be able to climb up Mont Ventoux carrying a 35 mm camera and its tripod on your shoulder, with cartridges and batteries in tow. In any case, we hit it off right away. When I made some short films a few years later with the great cinematographer Ghislain Cloquet, Vierny served as his assistant. Then I asked him to shoot Le chant du styrène in color CinemaScope. I even asked him to appear in a scene, as the only human being you really see—face on, shot from the waist up. He was very photogenic. I won’t get into an exhaustive recap of all our films, but I must mention that next we embarked on the adventure of Hiroshima mon amour. Together we checked out the locations that had been scouted in Nevers and its surroundings. Having taken photos with my Leica when I’d come by myself, I was really gratified to see how we could convey various impressions in 35 mm. I was obsessed with dusk, that moment when the sun disappears over the countryside. Was it really impossible to capture that on film? The two of us tried to find a way. Vierny was only shooting the French part of the film and had accepted the gamble of only finding out what Japanese cinematographer Michio Takahashi had shot in Tokyo after the film was edited, during color correction. For a cinematographer, it was torture to know his images would be combined with those of a colleague without being able to see them ahead of time. But Vierny was stimulated by the challenge. He never tried to make a secret of the tricks of his trade. I’d met other cameramen at producer Pierre Braunberger’s, for instance, and it was quite a secretive milieu; everyone kept his methods to himself. It was totally different with Vierny. We were constantly talking about the relationship between the film stock and light, the aperture, depth of field, sensitometry, and the potential of the photoelectric cell. All these discussions contributed to a very strong, nearly familial relationship. Here was a cinematographer who was interested not only in the look of the film but in its overall quality. We were joined by Philippe Brun, an extraordinary cameraman who was never caught off guard, like a chess player who plans his opponent’s every move a half hour early. The three of us shared a dry sense of humor, which didn’t prevent us from occasional fits of laughter. Once the script was far enough along, we’d have work sessions, discussing the dialogue line by line. Sometimes I asked the scriptwriters to make changes based on Vierny’s and Brun’s reactions. The same was true of the shot list. Vierny would drive me into a corner. I’d be ready to give up—“This is the effect I want, but I know I won’t get it, because of limitations in the stock’s sensitivity”—and he’d answer: “Yes, but we can try to compensate for those limitations with such and such a light.” We knew each other so well that, when we were on set, he could tell the frame and lens I was going to choose just by the way I looked through the viewfinder and moved up or down. He would start setting up the lights before I even told him what I wanted. You could count on Vierny’s support no matter what. That explains some of the on-set run-ins he had with our production managers. Both he and Brun were often criticized for always taking the director’s side. They believed it was the producers’ responsibility to keep the director happy. We were criticized for forming a rock-solid unit, impermeable to outside influence. When I was starting out, I found my abilities so poor that I might have quit if it wasn’t for Vierny, Brun, and my script supervisor, Sylvette Baudrot. When I made Last Year at Marienbad, for instance, I was in a constant mood of terror and anxiety, only alleviated by my collaborators’ skill and commitment. Even today, I remain astounded at the confidence they put in a director of short films, shooting his first features by special dispensation (I didn’t meet the French film administration’s criteria). Those three were the pillars that allowed me to construct my mise-en-scène and editing, like the roof supports of a Greek temple. Vierny was an aristocrat of the cinematographer’s trade. On first meeting, he could be very imposing. Actors sometimes mistook his demeanor for coldness, but they always came to love him. He was incredibly good at speaking to actors and had great respect for their work, considering their contribution to the film to be possibly the most important of all. He was conscious that the way the set was lit needed to be coordinated with the acting, and that a poorly lit set could destroy an actor’s work. He believed that everything should be done to make the actor feel entirely free—a relatively rare point of view when we got started in the business. He wasn’t looking for a predetermined aesthetic composition into which the actor had to wedge himself. After a take, rather than complaining that an actor hadn’t hit his marks, he’d reposition some of the lights so that the actor could repeat the same movements. He was irreproachable. I have no idea how one could fault him.